I’ve Found A Copyright Infringement – Now What? If you share your photography on the internet it is very likely that people are using them elsewhere on the web without your permission. No amount of transparent overlay images, right click disabling, watermarking, or other measures are going to stop this. Copyright infringements may be in the form of anything from use on personal blogs to commercial uses by large companies. Some may give you image credit, but most of the time I haven’t found this to be the case. Others may even take the credit for your image themselves! So how do you find these infringements on the web? How do you actually find your images being used without permission? Search engines such as Google, Bing and Yandex have reverse image search capabilities you can use to find your photographs. Other companies such as Tineye have built their business around reverse image search. For most of these services you can drag and drop an image from your computer to be searched, or copy and paste a URL instead. I find this to be a tedious method when I have many many photos to search for. Luckily there is an easier way through using browser extensions. Personally I use an extension for the Firefox browser called “Who Stole My Pictures?” that allows me to search for infringements on all 3 services (Google, Tineye, Bing and Yandex) with just one right click. The search results open into new separate tabs. 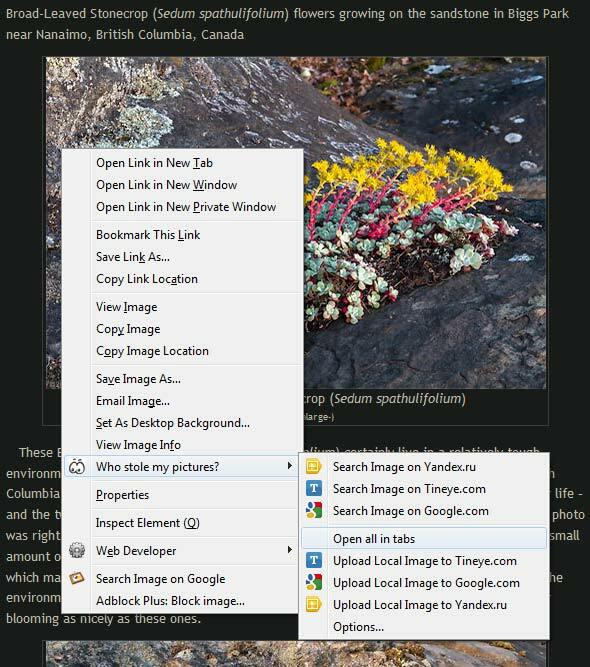 You can also download extensions that just use one of these sites for your reverse image search. Similar extensions exist for Google Chrome and likely other browsers as well. With most of my searches Google Images is the service that seems to find the most results. As I am searching for these images to pursue copyright infringement claims I will usually use all 3 services. The extra time involved continually clicking results tabs with no results is easily paid for in the 1/50 times when Tineye or Yandex will yield a result other than my own websites. Frequently these are results that Google did not find. August 2015 Edit: I have done a lot of reverse searches since I wrote this post back in early 2014. Since then, I do not think I have found a match on Tineye or Yandex that wasn’t on my own site or social media accounts. I know Tineye is still often recommended as the reverse search engine to use, but more and more I ignore it (and Yandex) now. Bing has started their own reverse image search service, but it mostly seems interesting in terms of finding infringements on Pinterest at this point. This is relatively new, however, so perhaps it will show improvement with time. So while I still use the “Who Stole My Pictures?” extension to search for infringements on Google, Bing, Yandex and Tineye concurrently on occasion, I generally now use Google alone for infringement searches. The screen capture below shows my Firefox extension in action – performing a reverse image search on one of my blog photographs. Note that this search is on one of my 500 pixel wide thumbnails. Sometimes searches on thumbnails and full size images (on my blog full size is 900 pixels wide) yield different results. It can be worth it with “popular” images to do a search on both your thumbnails and full size images. When using a reverse image search plugin, you can right click to search for infringements of your images with multiple services at once. What if I can’t right click on my images? For some of you the majority of your images may be on a site such as 500px, Flickr, Smugmug or Photoshelter that do not allow you to right click. While many of my infringed photographs come from my blog, the bulk of my image library is on Photoshelter. For those images I simply batch upload downsized copies to my own website in a hidden folder. I then load each photo and do the right click from there. When I am finished I empty the folder. For those of you without a website – there are fewer options. You can right click on G+ and images on Facebook if you have your images there. I tried this with both Dropbox and Google Drive and was unable to right click on those photos, though competing services may differ in that regard. Below are the search results for the reverse image search depicted in the first screen capture above. There were no results for Tineye or Yandex, so I closed those tabs and looked at the Google Images results. As this was a fairly recent blog post, I am not surprised to find only my blog in the results. Normally for each image I search I have a few results on Google – either from my blog or my Photoshelter image library. Sometimes my own posts on social media (mostly Google+) will show up here as well. Reverse image search results from Google Images. Regardless of the reverse search engine used, I scan the results for sites that are not my own, or are posts that I did not make. 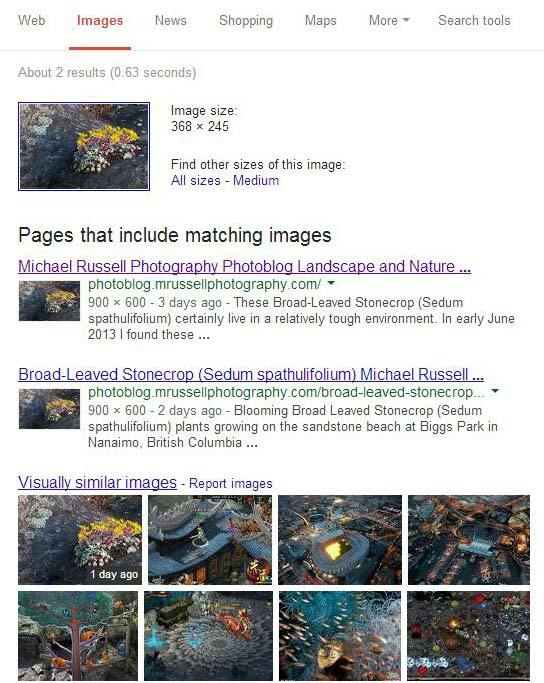 One area to point out in the Google results above is the area titled “Visually similar images”. Most of the time if the image I am searching shows up here, it is on one of my websites or social media profiles. However, I do think it is important that you hover over a photo in this area to verify its location. I have caught more than one infringement in the visually similar images area that did not show up in the main search results. In the case of the search above – the visually similar image was from my blog post. The above methods may not be the only way to accomplish this kind of searching, but in the many methods I have tried it is currently the fastest and easiest. If you have a way that works better for you I would love to hear it! I have found an infringement! Now what? I have written a follow up post outlining some of the options available if you have found an infringement: I’ve Found A Copyright Infringement – Now What? I hope that it will help point you in the direction to go next! Last week I shared a reflection of some early Fall colours at Silver Lake Provincial Park in the Skagit Valley near Hope, British Columbia, Canada. I drove out to Silver Lake last Thursday hoping for a calm surface for a great reflection – and I was not disappointed. This is Hope Mountain and Wells Peak reflected in the calm waters of Silver Lake in the late evening. The tougher part of photographing this scene is that the mountains are so close to the lake. 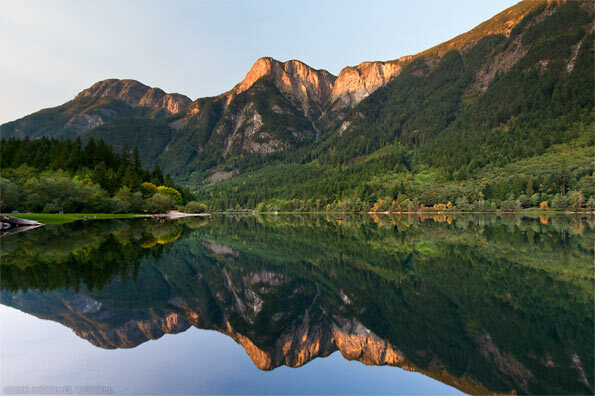 I often need to shoot with my widest lens (Canon 10-22) @ 10mm most of the time to get both the top of the mountain and the entire reflection in the frame. This caused a number of problems. One being a bit less possible variety in compositions that have the complete reflection, and some issues with stitching a few panorama attempts that I had made. After I had walked through the park a bit more, I was able to find this spot along the shore I had earlier not been able to get to due to higher water levels in the Spring. This gave me a bit more vertical room to show a little more sky and reflection than when I was closer to the mountains. I don’t know if I have mentioned this on my photoblog before, but I host a photography theme called “Mountain Monday” on Google+. If you are a photographer that is not on Google Plus yet, I wrote a blog post outlining why I think it is a great place for photographers. This week marks the 1 Year Anniversary of Mountain Monday! I made my first #MountainMonday post on September 26th of 2011 with this photo of Silver Lake. It seemed appropriate that I share a new photo of Silver Lake for this week! 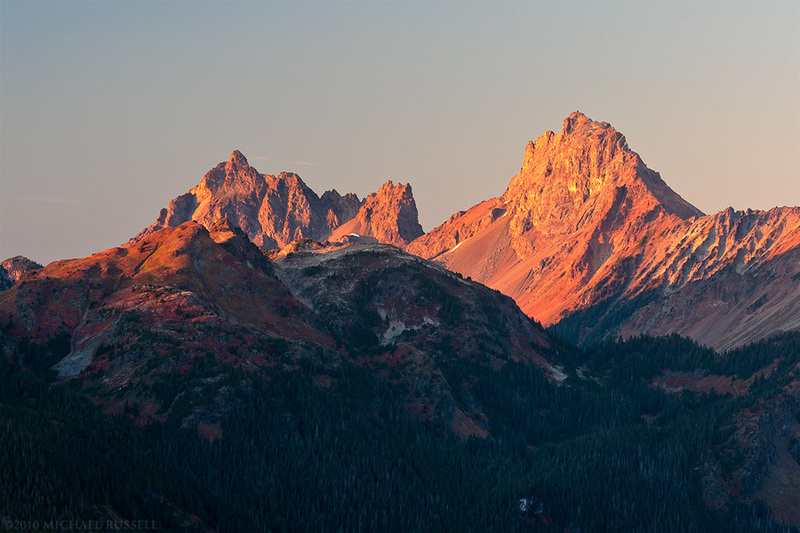 This is a photo I made back in 2010 of Canadian Border Peak and American Border Peak (with Yellow Aster Butte in the foreground) from Kulshan Ridge in the Mount Baker Wilderness. On Sunday I was going through some of my older photo files and decided this composition deserved some reprocessing so I could post it on for “Mountain Monday”. Google+ launched back in June 2011 (in September to the general public) and has been a big success. The photography community has been especially taken with it – and it is now my main social network for photography related pursuits. I am still active on Twitter and my Facebook Page but Google+ is where most of the action takes place. Every Monday I curate a theme called “Mountain Monday” where many photographers post their mountain photos and “tag” their post with a #mountainmonday tag. At the end of the day I post a selection of these images. Every week there is a substantial amount of fantastic photography. If you have mountain photos you would like to share – Mondays on G+ are a great time and place to do so. If you are not yet on Google+ you can read my earlier blog post about Google+ and photography back in September 2010.